Worry not, I shall write a great deal more about Rachel Alexandra as the week goes on and we get closer to Woodward Stakes Day. Me, and every other racing writer in North America. The time I spent in the Queen’s royal presence last Monday morning gave me ample material to write a book, or a screenplay. I wish Jess Jackson would love my writing, and ask me to document his big horse’s life for the silver screen. Rachel is not only a feast for the eyes and food for the soul–she’s worth her weight in printer’s ink. I’ll whet your appetite for the whole story from last week by telling you tell you that, in the midst of the storm that surrounds her–the mighty, invincible, unequaled Rachel Alexandra is a model of serenity. On Monday morning I dubbed her, Her Serene Highness, for I believe that this is her archetypal name, the moniker that was written in the stars before she was born. With video cameras whirring and still cameras set on “continuous” snapping away; journalists and reporters standing cheek-to-jowl around Steve Asmussen and mindless chatter as scores of voyeurs watched her take a bath–how invasive!–she worked, hotwalked and bathed without any indication that she even knew she was surrounded by interlopers. Her space was seriously invaded by those of us who love her; those who were assigned to cover the story and those who saw the golden dollar signs hanging like a nimbus ’round her perfect, beautiful, gorgeously-marked face. I have lived a long time, and been a racing fan for…ever–and I’m not sure I’ve seen such giddy, girlish attention paid to a horse, perhaps ever. I fully expect to see headlines announcing, “Rachel Breathes!”–stories documenting her every inhale and the psycho-sociological/historic implications thereof. The psychic smothering by so many people–even when it’s done in the name of love–could make a being, equine or human, a tad nervous. To say the least. Completely and utterly psycho would be more likely. But not Rachel Alexandra. I was reminded of His Highness Sheikh Mohammed bin Rashid Al Maktoum. The truly powerful don’t need to flaunt what they have, or can do. At the Fasig-Tipton Yearling Sales on August 10th and 11th, His Highness was very casually dressed and bespectacled, moving through the crowd with grace and quietude of heart. Unlike the flashy nouveau riche whose insecurities require that they don their most ostentatious designer togs and every diamond in the box–one of the wealthiest men in the world felt no such requirement. He knows who he is; what he has and how much power he possesses–and that no amount of designer flash was required to convince himself or others that he’s OK. The possession of genuine, personal power is very good for the soul. Whether the power is yours because you rule a country or just because you’re confident in your own abilities and wholeness–power is very appealing to those who observe you in your peacefulness. Real power is attractive precisely because it indicates the acceptance of one’s self. Alexandra, Superhorse–truly walks in beauty like the night. She carries her power within, and–having no need to act out, be a spoiled brat, lock herself in her stall or threaten those who would crush her with their adoration–moved silently around that ring and stood regally and calmly in a situation that would unnerve one who had not her peace of heart. The peace that comes only from within, from embracing one’s own power–and only as a byproduct of absolute confidence and the ability to take it all in, filter it–and yet not be affected by any of it. This past week has, for me, been a time that offered many opportunities to freak out, lose my cookie and worry until my dreams are plagued by dancing, demonic fish-faced modern dancers. Every life has its ups and downs, and this week threw some downs at me. The next seven days may tempt me to worry. But the potential for bliss is always present, too. And bliss, on the other hand, can carry us on its gentle wings to unexpected heights and places of new creativity. 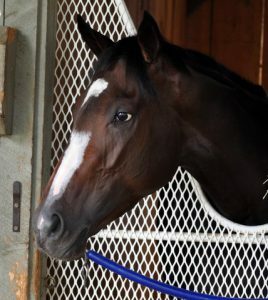 Bliss, as I understand it, is the unexpected joy that springs from a heart that is, like that of our beloved Rachel Alexandra–calm, serene and confidently strong, even in a maelstrom. The serene heart knows that nothing that Life throws at us–bad news or stalking by paparazzi–nothing can conquer or dismay the truly peaceful at heart. Worry is the almost immediate response to the curve balls that life throws at us. We get tossed a curve, and we immediately kick into worry. And worry–as its companion demon, fear–never accomplishes a thing. Nothing is gained by being preoccupied by worrying about something. Worry never changed anything. Prayer changes things. Action can change things, if it’s a situation in which we have some measure of control. Recruiting the aid of friends can help. But worry? Fear? Running around like a beheaded chicken? Nothing good can come from losing my mind over a situation, regardless of how dire or unfair it may seem. Jesus said that not one minute is added to our lives by worrying. In fact, it’s probably the opposite: worry causes stress, and stress is responsible for so much illness, thanks to that tricky mind-body connection. Worrying can make you sick, so the tendency to worry should be cast aside, tout de suite. I’m going to take a page, instead, from a friend. Her Serene Highness, Empress of All Her Eye Surveys Rachel Alexandra. Well, OK, Rachel Alexandra isn’t exactly a friend. We’ve never snuggled, or even touched each other. Yet. (Hope springs eternal.) But I love her, and we exchanged spirit contact last Monday–which truly, I promise to describe in detail, probably Tuesday. Regardless of the negative observations of naysayers who insist that horses are four legs, no brain and potential protein sources, they are, to those of us attuned to capital-T Truth–archetypal, spiritual, centered beings. They seem to know secrets about Life that we mere humans, if we manage to just sit still and listen–can hear and learn from our bemaned counselors. If you get the chance to touch a horse–especially a horse as centered as Rachel Alexandra–do so. Do not hestitate. Do not wonder if the horse will think you’re nuts. 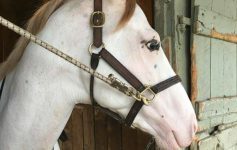 Always ask permission of a horse’s owner or other connection, but, once that is secured: do it. Just let the horse sniff you, and s/he will take it from there. Thoroughbreds, while they have a reputation for being insane and prickly–are, in my experience, quite the opposite. 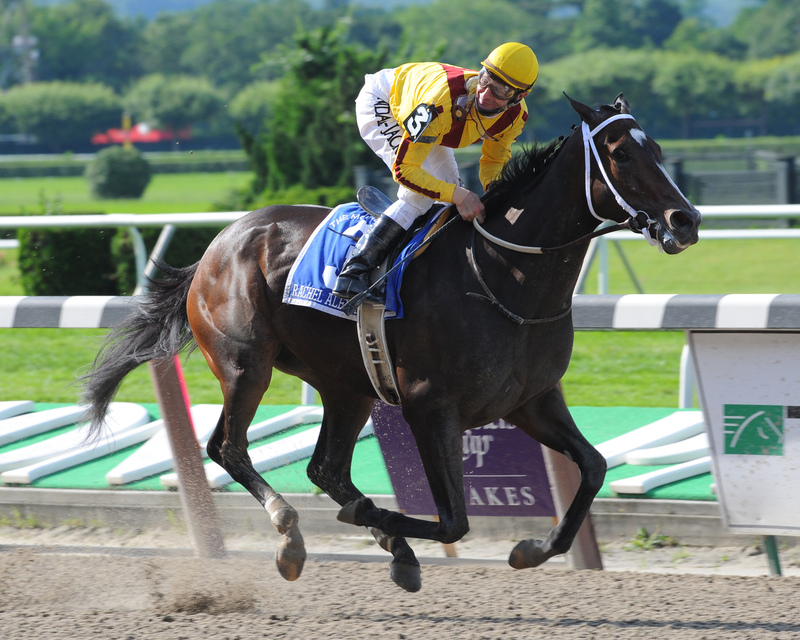 Rachel Alexandra is a priestess of her sect. We can learn great truths from horses, and a being on the level of the Queen teaches us first and foremost that peace of heart–serenity–even in the center of a storm, good or bad–is possible. Take a page from Rachel’s book, and acknowledge your own inner power. Let that power connect you to yourself and to the Divine. Take that power, focus firmly on the future and let the peace radiate out from the inside. Close your eyes. Open your heart. Hear the siren song of the horse, and listen to the aria that has but one lyric. 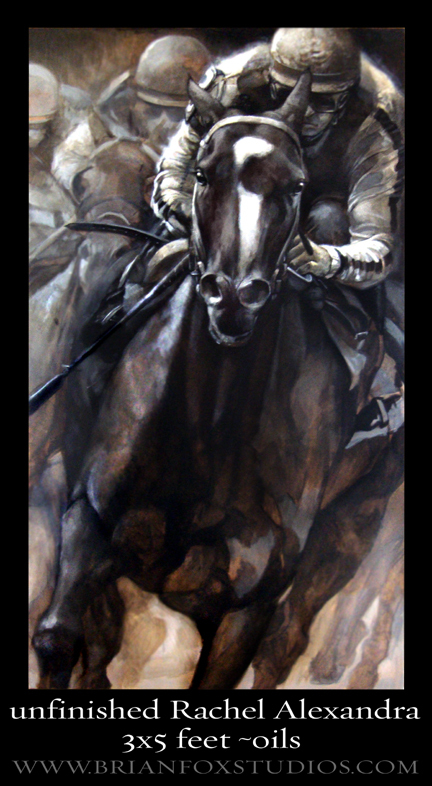 When Rachel Alexandra is confronted with pressure to lose her nut, to panic in the face of the crushing throng, she arches her powerful neck, head toward her heart and moves through the crowd as if on a different plane from all others. Her response to pressure, her lesson for tonight, is the absolute refusal to allow the cacophony to enter her personal space. Rachel say, “Neigh” to the useless option of worry–and so should we.